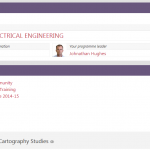 Moodle programme sites provide a single, permanent presence for all students enrolled on the programme code, and are often used to provide a range of items relevant to the programme (see foot of the page). Programme sites are not created automatically but by request at the school office, and you can search Moodle to see if a site exists for any programme code. a link to the programme site (if available) otherwise the programme title is displayed. a link to the programme handbook PDF titled as Your programme information, otherwise this is blank if no PDF is available. the programme reperesentative if there is one, otherwise the statement ‘no reps found’ with a link to the ENSA website. the programme leader as defined in SITS. Programmes leader/codes can be found by searching the catalogue and any errors should be reported to the school office. 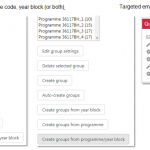 It is common for programme codes to be joined (crosslisted) with other codes into a common Moodle course (coded XL) and this can be done by the school office. Examples include joining FT and PT programme codes or an entire programme suite, and this has the advantage of reaching a large number of students. Note that student’s MyProgramme block will always display their SITS programme title but will link to a crosslisted programme site. 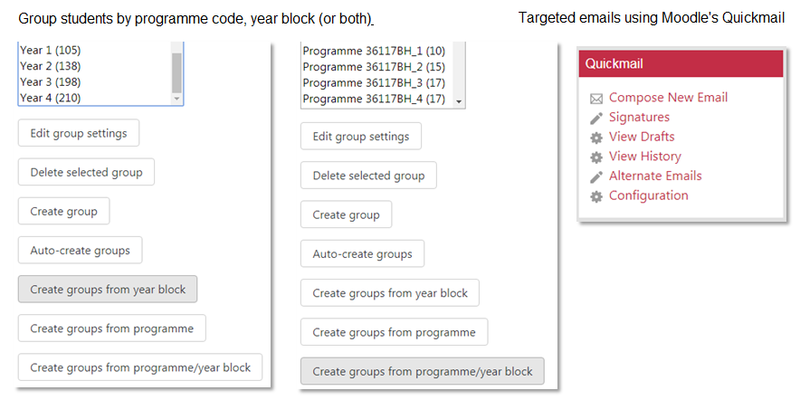 Programme sites can group students by programme code, by year block or both, and this allows for targeted emails using Moodle’s Quickmail feature.